Mickey Adventures Owner & Travel Vacation Specialist! 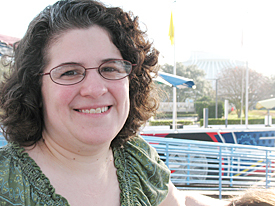 My name is Jen Zinno, and I’m the owner of Mickey Adventures. I’m so happy you’ve decided to plan a vacation with us! Mickey Adventures started with a focus on Disney destinations. We know that Disney is magical, and I’ve always considered it to be my happy place. It just seems to have a way of transporting me away from the real world. As soon as I set foot on Disney property, I leave my worries behind, and I can be a kid again. I grew up in Rhode Island, and currently live in Sharon, MA with my 3 children, ages 9, 12, and 15. We’ve been to Disney World many times with the kids, as well as several times before kids. We’ve also been to Disneyland, and we’ve taken several Disney cruises, including an incredible 14-night journey through the Panama Canal. I love finding ways to bring the magic to families of any size. I really love planning trips for young children. There’s nothing more magical than a preschooler who truly believes they are in the midst of magic and meeting real characters! I still remember my daughter coming out of the Bibbidi Bobbidi Boutique (a princess makeover) at the age of 4, looking up at me, and saying “Mommy, I’m going to remember this for the rest of my life!” Lifetime memories are what Disney is all about, and Mickey Adventures wants to help you plan them! As your travel specialist, I can plan your entire trip for you from start to finish. Any of our agents will find you the best deals, help you choose a time to travel and the best resort for you, help you navigate all the dining options, and figure out the best way for you to tour the parks and have the most magical time you can! And as Mickey Adventures has grown, we’ve realized that our vacation planning services can expand beyond our original Disney focus, and help our valued clients wherever they want to travel. We plan vacations to Universal Studios Orlando, SeaWorld, Discovery Cove, major cruise lines, all-inclusive resorts, and more. Our goal is to find the right trip for you, and help make it a seamless experience that doesn’t leave you stressed before you even walk out the door. So don’t delay, and contact Mickey Adventures to let us help make your dreams come true. Connect with Jen on Facebook!